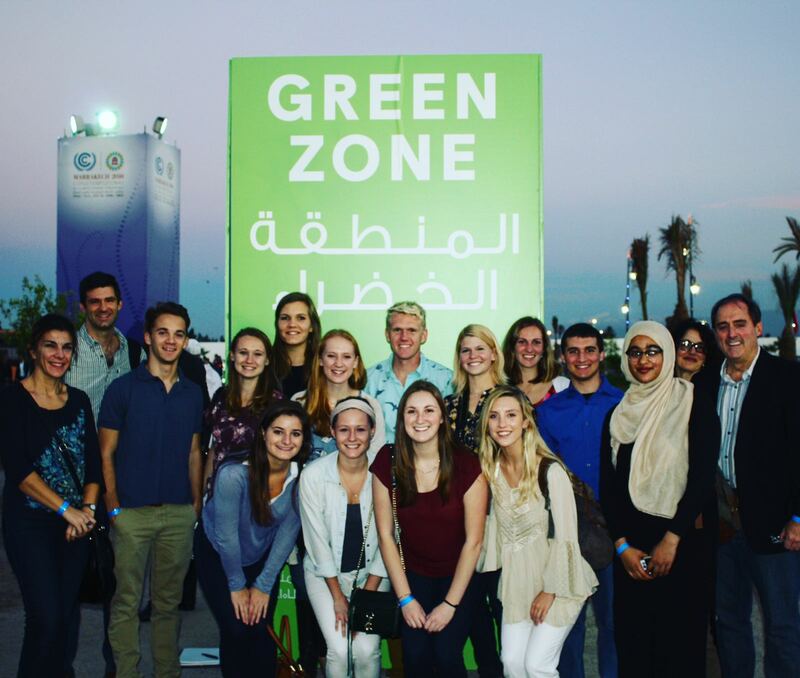 The conference theme for our group’s first full day in the Green Zone at COP22 was Financing, featuring numerous concurrent sessions about topics like funding alternative energy projects and the price of carbon. While such topics are not the first thing I think about as an environmental scientist, I realize that money is the driving force behind most things, and that financial considerations are critical factors for combatting climate change and achieving sustainability goals. However, I found myself wandering away from the economic jargon at these meetings and exploring what the rest of COP22 had to offer. Turning a corner, I heard a presentation about the effects of sea level rise on cultural identity. The International National Trust Organization (INTO) out of Great Britain was hosting an event highlighting the heritage loss that is associated with climate change. The fate of island nations such as Kiribati, whose elevation is less than three meters on most islands, are most at risk from increasing sea levels. In addition to losing the land and homes these indigenous people need to survive, the culture that is tied to their homes will be drowned out. The presenters showed INTO’s research on the importance of cultural identity to a person’s health and wellbeing and the significant sociological impacts of cultural loss. This aspect of climate change is often overshadowed by the scientific and economic topics, but I found it compelling to more holistically consider the services supplied by the environment. The presenter went on to quote English novelist and poet from the 1800s, William Morris, stating, “They are not in any sense our own property to do with as we like with them. We are only trustees for those that come after us.” He said this concerning historical buildings and artifacts passed down from one generation to the next, but when I heard this, I immediately applied it to the environment. Our current society should be the guardians of the environment for the future, not the destroyers of it. As Morris says, it was passed on to us but it does not belong to us to do with as we please. The environment will forever belong to future generations. United States representative from the White House discussing how the federal government is leading by example by transforming its own vehicle fleet to ZEVs and LEVs. Photo taken by Christen Bellucci. At first, I will admit I was initially disappointed at the lack of representation I saw from the United States at COP22. It seemed as though my discontent with America’s next choice President elect and my reservations about the next four years were traveling to Morocco with me. As the week progressed, I became a little more open minded and inspired. At COP-related events, I met students from the University of Minnesota, Columbia University, and University of Central Arkansas, and I attended panel discussions featuring U.S. representatives. There was one panel in particular that was of interest to me. It consisted of delegates from countries that have agreed to cut back on their carbon emissions through transportation initiatives. French and American panelists identified similar objectives with differing policy strategies. Both countries stressed the role of reducing vehicle emissions in reaching the 2030 carbon reduction targets. The French delegate described an approach that required change: for example, rental car companies are mandated to incorporate low emission and electric vehicles into their fleets. On the other hand, the U.S. delegate advocated for an approach focused not on directives but on leading by example in order to transform the transportation sector. The U.S. representative explained the American methodology is to use the government’s own federal fleet vehicle purchases as a catalyst for companies and the public to follow suit. In a country that was built upon the principles of liberty, such a method should prove more effective. Obtaining an understanding of these government policies, I am encouraged and hopeful for the future of the United States’ climate control intervention. Before applying to attend COP22 in Marrakech, I had done some preliminary research with an advisor on the previous COP, studying the equity implications of emissions reductions goals by different countries. In particular, we focused on members of the G20, and did a case study of the Nationally Determined Contributions by Mexico, the United States, and Japan. At the time, I lamented that even with the President’s progressive take on climate change, the plan for reductions submitted to the UNFCCC by the U.S., was scarce in both quantitative and qualitative detail. Then Donald Trump was elected and, unbelievably, things became more uncertain. Artwork created using plastic bags, seen at the Green Zone. Photo taken by Christen Bellucci. So, when I arrived in Marrakech with the rest of the UConn group for COP22, my main expectation was that those attending the conference would speak almost exclusively in the context of America’s new role in efforts to adapt and mitigate for climate change. However, I was surprised to learn that, even with the major political shift in the U.S., these countries attending, especially the developing ones, were more focused on regional methods. This was highlighted nowhere more expertly than during the panel discussion on Climate Change Adaption and Resilience in Africa. Throughout the panel, COP22 was consistently highlighted as an African COP, one that was more accessible to developing African countries, with smaller economies. The hope was that this COP could help unite them in efforts to prepare for climate change. The panelists also discussed the role of academics in innovation and research, and the importance of scientific academies across the continent. Even those African delegates who disagreed with some of the logistics of implementing the Paris Agreement, were not arguing about America’s role, but rather about the Francophone relationship, and how it has affected development in French-speaking African countries. Holistically, this panel, among others, opened my eyes to the insular view that (some) Americans have on the climate change issue. It also reinforced the notion that collaboration among nations was a key to resiliency against the more pressing consequences of climate change. The panel showed that although the U.S.’s own adaptation and mitigation strategies are undoubtedly important, our country must also work closely with developing nations so that they can learn from our experiences – good and bad – then can grow responsibly, without the same environmental consequences as countries in Western Europe, North America, and East Asia. Even as things look temporarily bleak for America’s federal government, the rest of the planet is still working hard to mitigate the impacts of climate change. 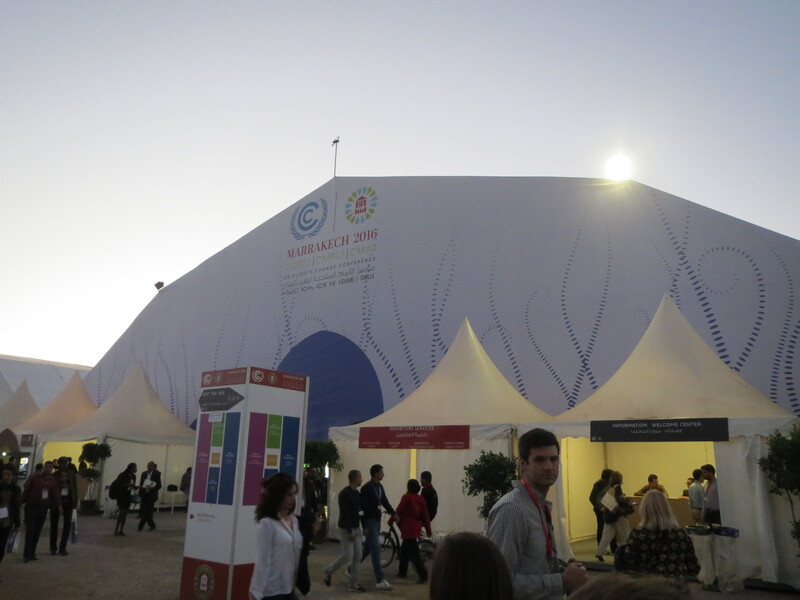 Each day, we attended several panels, discussions, and displays throughout the COP22 Green Zone. Several companies demonstrated how they’ve taken advantage of landscapes such as Morocco’s to create and market renewables. MASAN, for example, is one of many solar companies who seek to increase Morocco’s renewable energy usage to 50% by 2025! Other companies, such as Bombardier, have invested in making trains throughout Europe and the Mediterranean that are more energy efficient, faster, and made of materials that can easily be recycled when the trains are outmoded. Even Royal Air Maroc, the airline we flew to Morocco from NYC, had a display that discussed fuel economy innovations that reduce the carbon footprints of its planes and the use of dry cleaning methods that reduce water and energy consumption. COP22 Green Zone. Photo taken by Christen Bellucci. Transportation was also discussed a great deal in one panel series that I attended on E-Mobility. Among the speakers was a Minister from Quebec, who proudly explained that his province has capitalized enormously on the opportunities provided by an expanding market for hybrid and electric cars. Quebec, alongside Holland and California, is a founding member of the Zero Emissions Vehicle (ZEV) Alliance. As a member of this group, Quebec has become part of North America’s largest cap-and-trade entity. Using legislation from California and nine other US States as a guide, the province has passed Canada’s first legal ZEV standard. Furthermore, Quebec works with the private sector to promote the spread of hybrid and electric car sales. The provincial government offers an $8,000 rebate to those who purchase ZEVs, and Nissan has agreed to provide credits to drivers who trade in and purchase used ZEVs. Nissan is also developing more efficient batteries for their cars to comply with COP21’s emissions recommendations. These deals have allowed Quebec to export its eco-friendly cars, and to expand its network into U.S. states like Vermont and Maine. A representative from California expanded on this. He explained that the state has an emissions goal of 40% below 1990 levels by 2030. Another panelist discussed the similarly progressive actions taken by the French Government. France currently requires more than half of public fleets to consist of ZEVs, and will mandate 100% by 2025. Private fleets will also be required to have aty least 10% LEVs by 2020. Another intriguing panel discussed the advances in modeling climate solutions. Scientists working for the U.N.’s Department of Economic and Social Affairs (DESA) have created a system for advising countries around the world on bringing electricity to all people. These scientists use the Climate, Land use, Energy, and Water Strategies (CLEWS) system to determine how best to improve the lives of civilians around the world. The UConn contingent outside of the Green Zone. Photo taken by Mark Urban. From all of the sessions that I attended, and all of the displays and exhibits I visited, I understood one thing very clearly about how the rest of the world is working on climate issues. There is no question about whether or not the climate is changing. There are no debates between scientists, journalists or celebrities as to whether or not humans are the cause. Every scientist, policy maker, student, businessperson, and teacher attending the COP has accepted that the effects of man-made climate change are already harming their countries and communities. The focus at this conference was on how to adapt as quickly and sustainably as possible to droughts, floods, storms, wildlife loss, and agricultural shifts. There was a sense of urgency in the Green Zone. Where COP21 was concerned with forging a lasting international climate mitigation deal, the theme of COP22 was implementation and action. Across the planet, people are tired of simply discussing the issues, and they’re tired of trivial changes. The global body is starting to act. The world is moving forward, with or without the United States government. Progressive companies and innovative green entrepreneurs throughout North America, Europe, Asia, and Africa are capitalizing on the ever-expanding demand for renewable energy and clean technologies in the global market. Many nations’ governments, as well as U.S. state and local governments, and colleges and universities, continue to create and enforce policies and best practices that alleviate the harms of pollution and environmental degradation to civilians. The United Nations and NGOs continue to seek out sustainable uses of natural resources using the newest and most accurate available science. And our millennial generation, more connected than ever before, need only break out of our online echo chambers to build the largest, strongest, and most actively coordinated global community in human history. The next few years, even the next few decades, may be very difficult. But we, the people of Earth, have the power to make the world better for ourselves. It will take unprecedented communication and organization, but in the end I believe that we will make this world better for the next generation. At UConn, I spend a lot of time working with my incredible team of undergraduate engineers on the Ethiopia Project from Engineers without Borders. Like many countries in Sub-Saharan Africa, Ethiopia as a country is particularly vulnerable to climate change. With highly variable seasonal rainfalls and a disproportionately high dependence on sustenance agriculture, increasingly extreme droughts, attributed to climate change, have had devastating effects on food security. 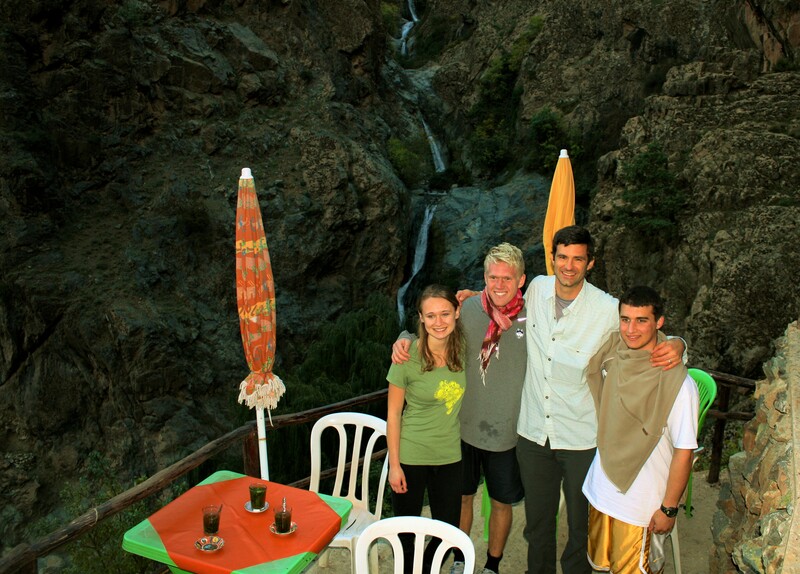 Kristin Burnham at one of the seven waterfalls encountered during the contingent’s hike up the Atlas Mountains. Photo taken by Mark Urban. The first full COP 22 session I attended was presented by members of the Network of African Science Academies. Despite Africa only contributing 4% of the global carbon emissions, 36 of the 50 countries most affected by climate change are in Sub-Saharan Africa. Africa lacks the infrastructure that North America, Asia and Europe have to deal with climate change. When I think of fighting climate change I think of reducing greenhouse gas emissions. I think of solar panels and alternative fuels. I think prevention. In this panel, fighting climate change had an entirely different tone. Fighting climate change meant research and modeling to predict where climate change was going to cause the most damage, who it was going to affect the most, and how to most efficiently limit the destruction. This is not to say that Africa isn’t making great strides in sustainable, renewable energy resources. This is the harsh reality that no matter what progress we make, no matter what we do, climate change is happening. The effects are real, they are destructive and they are, to a degree, inevitable. Faced with limited infrastructural and human resources, focusing discourse solely on prevention is a luxury that Africa, and many other developing countries, can’t afford. 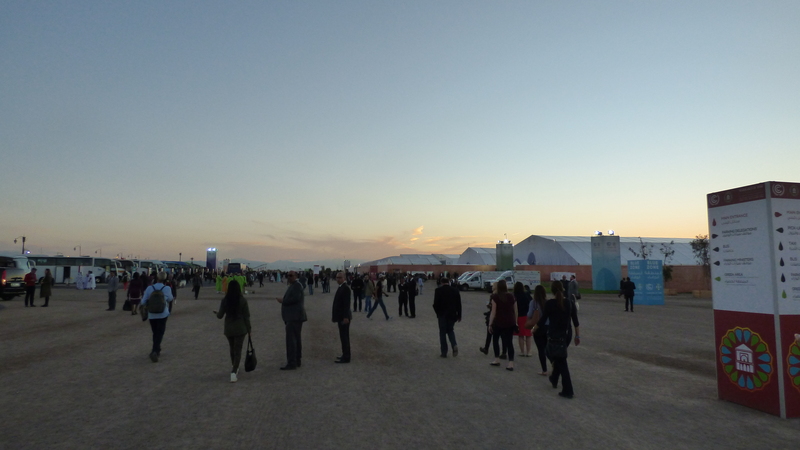 A view of the COP22 Innovation Zone. Photo taken by Christen Bellucci. A COP22 panel discussion I attended, titled the ‘African Coalition,’ included several French businessmen discussing renewable energy expansion into rural areas of Africa. They described electrification of the African continent not as a business opportunity but as a business responsibility, almost a moral imperative to provide people in these developing nations with the product they are selling. They stressed the importance of creating markets to deal with the issues related to deploying renewable energy at local levels in the developing world. Another panelist, Abdoulaye Sene, who was President of an NGO, Global Local Forum, explained that energy dispersion across African nations faces bureaucratic and administrative challenges. He also opined that technical training, on electrical engineering and installation skills, is extremely important. He thought it should be the renewable energy businesses’ duty to extend these resources. As a result of Morocco’s long history as a French colony, France has a large influence on many aspects of Moroccan government, resources, and society. However, as a questioner pointed out at the end of the roundtable discussion, many Moroccans believe that France has reneged on deals and promises, to the detriment of sustainable economic growth in Morocco. It will be interesting to see whether a more market-based, but socially-responsible, business approach, like the one described by the panelists, succeeds better than the approach used by politicians and government officials. The business approach may provide a more stable path to electrification throughout Morocco than ever before because of the business imperative to succeed or lose capital investment. Since electrification, especially with solar power and other renewable resources, is a critical issue throughout the developing world, it would have been an even more effective discussion had there been additional representatives of African nations, and their specific interests and concerns, on the panel. There are the typical buzzwords around climate change policy that were echoed in almost every sector at COP22: sustainability, clean energy, conservation, and the list continues, but never did I hear a mention of human rights until I attended a particular panel discussion. The Paris Agreement was the first international declaration on climate change to address human rights. It states in the preamble of the agreement, “Parties should, when taking action to address climate change, respect, promote and consider their respective obligations on human rights.” So the COP22 panel entitled “Human rights and climate change: what’s next after Paris?” sounded promising. As I listened to each of the panelists, I was inspired, even a bit overwhelmed, by the level of concern and consideration expressed for human rights issues in the climate policy discourse. 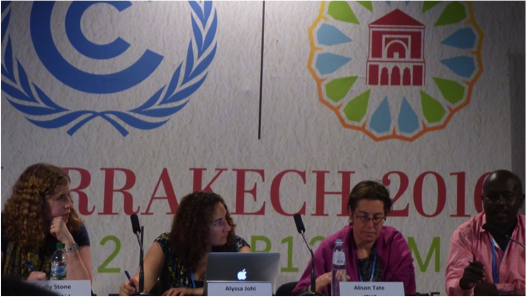 “Human rights and climate change: what’s next after Paris?” panel at the COP22 Green Zone. Photo taken by Klara Reisch. Kimaren Ole Riamit from the IIPFCC spoke about indigenous people and how climate change policy has affected and will affect their livelihood. “Indigenous people represent a world we are trying to achieve,” he remarked. They are the ones who contribute the least but suffer the worst. An example of such exploitation is through the unjust acquisition of land. Land grabs have targeted millions of hectares, and have displaced indigenous people in attempts to build industries and further agricultural investments. These land grabs are not exclusive to the oil, coal, and agricultural industry, but have been a result of biofuel and bioenergy efforts as well. Governments are signing away land to build sugar cane plantations for ethanol production or jatropha for biodiesel. This forces neighboring communities to bear the effects. In the United States, specifically, there has been an outcry about the development of a pipeline through indigenous land, but what if this program was not a pipeline but a wind farm or carbon storage area? Regardless of whether we are drilling for oil or developing the newest technologies for environmental sustainability, the effects on the native communities are not to be forgotten. Kelly Stone, a panelist from Action Aid at the event explained, “It’s not just a loss of property, it is a loss of livelihood and identity.” If we are implementing new climate change policies, we have to consider what the human rights risks are and who will bear those risks. It is easy to over-idealize climate change policy because the distant effects on the general population overshadow the effects of those in our backyards, but we should not stand for it. Conflict doesn’t always need to involve a “good” and an “evil.” We do not question nor vilify the need for sustainable practices in our world in order to combat the effects of climate change. But sometimes these efforts have negated another core axiom upon which this world is built: human rights. 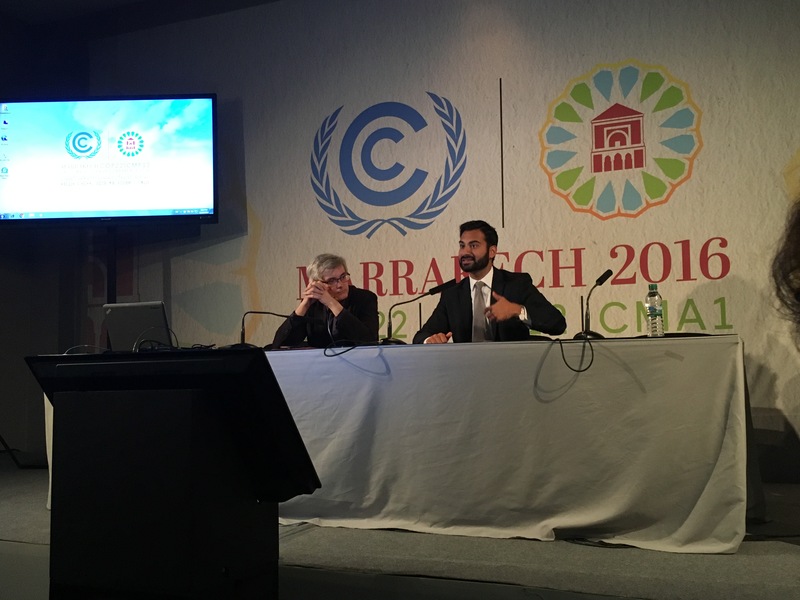 I attended a session at COP22 featuring a panel of human rights activists, who were present during the Paris Agreement negotiations at COP21. Last year, when the language of the Paris Agreement was still in the works, these activists fought hard to protect the rights of all. Yes, indeed – they found clauses upon clauses, which despite their potential to infringe on the rights of communities (particularly the indigenous), remained unchanged in the Agreement, as if justified by the salience and nobility of the climate change cause. Outside COP22. Photo taken by Klara Reisch. Even now, certain provisions in the Paris Agreement leave it very possible for land to be stolen, livelihoods lost, and ecosystems destroyed in the name of large renewable energy or biofuel projects. In particular, there is a failure to address the needs of indigenous populations. This is especially true for the administration of the Green Climate Fund, which is the UNFCC’s primary financing mechanism for climate mitigation and adaptation projects in developing nations, projected to cost about $100 billion a year by 2020. The participation of indigenous people is not considered in the Green Climate Fund. Access to the fund occurs either through accredited identity or a formal letter. This process combined with the lack of representation of the indigenous within the language of the Paris Agreement (showing up three times, in only the preamble and declarative clauses) seems to guarantee that their voices will neither be heard nor considered. The Paris Agreement also fails to consider the engagement of such populations, or the potential benefits that non-western knowledge systems can provide in combating climate change. Usra outside COP22. Photo taken by Klara Reisch. With irresponsible attempts to introduce clean energy to societies, food prices tend to soar, the quality of water declines, and land grabs occur. Residents of the developing world are left to suffer the most. Human rights advocates estimate that 17 million hectares of their land was grabbed for projects that benefitted primarily western countries and corporate interests. Land is a limited resource. Equipped with such honorable intentions as renewable energy development, it suddenly becomes easy to just…steal it. For example, the Aguan Biogas Project, Barro Blanco Gravity Dam, and JK Papermill Afforestation were all incredibly noble attempts to reduce greenhouse gas emissions or create renewable energies. However, each was noted for its failure to consult with and consider the needs of community members and civil society, and each was responsible for the brutal displacement of indigenous populations and the depletion of resources necessary for their survival. We need to do better. It is by no means impossible to shift to renewable practices while keeping the rights of all in mind. Consulting with communities and amendments to the Paris Agreement with more inclusive language are the first steps. The path to sustainability might not be as clear as we had hoped for, but it is, without doubt, there. A diverse group of trade and labor union representatives, from Philippian electricians to Canadian oil sands workers to New York nurses, presented the concept that through ‘just transitions,’ the people who stand to lose the most from transitioning away from oil and coal can become the people who have the most to gain from investment in renewable recourses. Kristin (right) and Klara at COP22. We were all thinking it – How possibly could a labor union representing oil workers benefit from less oil production and more use of renewable energy? The answer for Kim Conway of Unifor, a Canadian trade union, was simple: the goal of trade unions is ultimately to ensure protection of workers’ pay and jobs. If the government, NGOs and local leaders are willing to open the policy discourse to include trade unions, if the tone shifts from leaving the coal industry behind to moving coal workers forward with new jobs in the emerging renewable energy market, if there is a ‘just transition,’ unions will fight with them. It is undeniable that unions have formidable political power. We saw their political prowess in shaping labor policy in the 1960’s and we saw it again in the election of Trump. So rather than villainizing coal workers for denying climate change, for fighting to keep their industry and livelihoods, let’s fight for the government to specifically include energy labor unions in all plans to transition to renewable energy. Let’s not forget the coal workers whose hard work powered our nation, often at the cost of their own personal health and safety. Let’s make sure the transition to clean energy is a just transition not only because time is short and we need everyone’s support, but because it is the right thing to do.